In the company of influential guests from Miamiâ€™s vibrant cultural and social scene, De Beers celebrated its new home in Bal Harbour Shops with an exclusive, art-inspired event at Le Sirenuse, The Four Seasons Surfside, on Wednesday April 10th. A jewel set amidst the lush, luxurious landscape of Bal Harbour Shops, the new store represents the third U.S. location for the legendary Home of Diamonds. 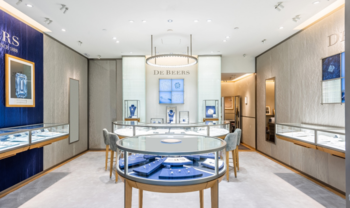 â€œWe are very proud to celebrate the opening within the most renowned and elegant mall in Florida,â€� said Francois Delage, Chief Executive Officer, De Beers Jewellers. At the event, guests were able to experience one-of-a-kind High Jewellery pieces, each one a work of art, with the De Beers Talisman, Swan Lake and Soothing Lotus collections all being modeled throughout the evening. Also, on display was the De Beers Talisman Wonder, featuring a mystical combination of 110 rough and 580 polished diamonds with a total carat weight of 271. This piece, which took over 2,000 hours to create, pays homage to ancient traditions while infusing it with a contemporary edge. Just as natural diamonds are at the heart of everything De Beers does, Mother Nature also plays a part in inspiring design. To celebrate the Bal Harbour opening, a limited-edition cover for the De Beers Assouline book, inspired by nature, has been created. The cover is a result of a new collaboration with Argentine-American artist Deon Rubi, a fixture in Miamiâ€™s art scene and whose work has been featured at PAMM and the Institute of Contemporary Art Miami. â€œI created an image using nature as a sculptural object and water as a medium for lightness, transparency and reflection, tuning into De Beersâ€™ commitment to beauty through the natural world,â€� says Rubi. â€œLooking through water creates a moment where time is suspended, like holding your breath, like looking closely at a diamond.â€� Rubi is known for marrying a delicate femininity with a strong industrial minimalism and her particular aesthetic brings a distinctive edge that complements the wondrous jewels included within the book. With a performance by Miamiâ€™s DJ Yissel and accompanying violinist Siobhan Cronin, the evening was a curation of exhilarating creativity. The new store is located at the Bal Harbour shops at 9700 Collins Avenue.